My husband thinks I have a special way with Mexican food. I love the spice combinations, the cooking methods and the vegetable ingredient combinations. Sometimes, I cook everything the slower traditional way, but when I need to cook dinner quickly on a weeknight after a day of work I use some shortcuts I've developed. For the green gazpacho I let this recipe from the blog Vegangela be my guide. I say "my guide" because it is difficult for me to follow a recipe completely. I am opinionated about food. 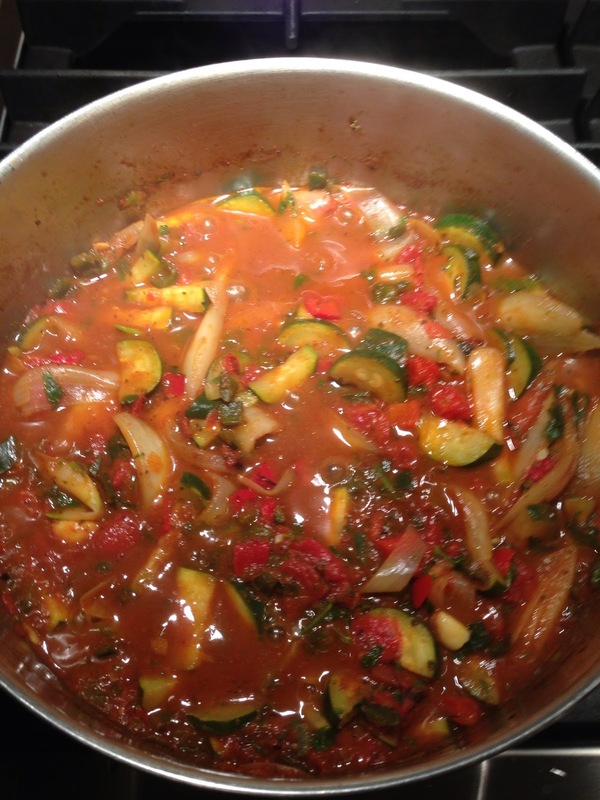 Then I created this Mexi-tasting vegetable sauté. Remember I told you how to roast peppers before, and I usually keep some in the freezer. I buy Trader Joe's corn tortillas made up of corn, water and lime - only. I like Better Beans - Rethought Beans that I find in the refrigerator section of Wegman's Nature's Marketplace. They come in a few different flavors of a few different beans. Use your favorite Better Beans or canned refried beans. It's really easy to make your own by thoroughly mashing a can of beans and adding garlic and onion powders. 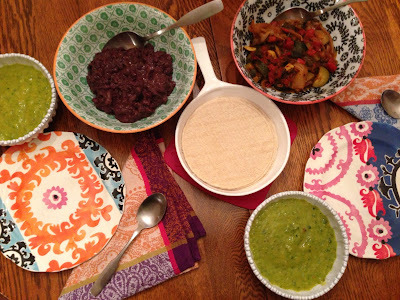 Here's my recipe for Soft Taco Beans and Veggies. Serve it with the green gazpacho and you have a fiesta. Sauté garlic in olive oil as soon as it begins to char add the onions, mix and cook together until some onions become dark. 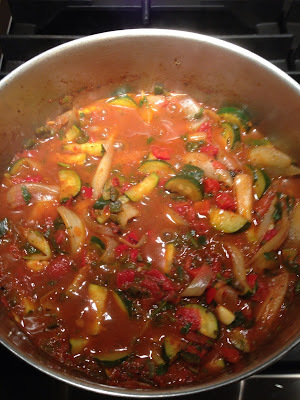 Add the zucchini, poblano, red pepper, broth, leftover salsa and tomatoes then simmer for five minutes. Add the spices and simmer covered for 10 minutes. Add the cilantro, continue to cover and cook until the vegetables are tender. Mix in the lime juice. Heat the tortillas in a covered dish. Heat the refried beans. Place a spoonful of refried beans then vegetables in a tortilla, fold and eat.